Years ago, a senior theatre person had come as a guest lecturer in a workshop that we were conducting. While addressing the participants she was lamenting the loss of art from our daily lives. She gave examples of the traditional verses women sang while performing different tasks at home, of embroidery, of rangoli. I was reminded of her words while walking to the workshop and back every day in Bangalore. 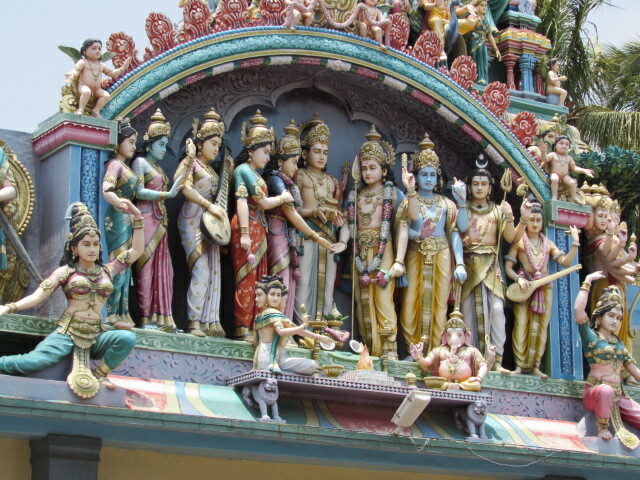 I am in, what I believe to be, an old and / or traditional area of Bangalore. In this area, there are almost no apartments. There are small bungalow-like houses inhabited by one family or, at the most two – one on the ground floor and another on the first floor. 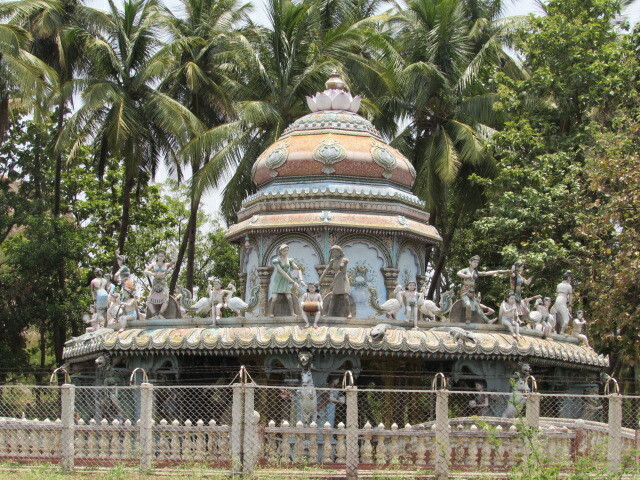 In whatever space is available, most people have brought in some aesthetic design element to the exterior of their house – a mural, pillars with designs carved or painted on them, painting of a beach scene complete with a dolphin, a unique colour scheme, an abundance of plants and creepers giving the house a jungle-like look… Each home has small potted plants. Some have bigger plants too. All the streets have trees on each side. Its lovely to walk in this area. So, every day I walk to the workshop and back. I see a beautiful rangoli outside almost every house that I pass on the way. Right outside the gate of the house, on the footpath, you will find a rangoli. Some rangolis look permanent, as if painted. Some are drawn afresh every day. Some are quite detailed, elaborate or complex in design. Others are much simpler. I photographed some when I walked to the restaurant for lunch. There was an interesting light and shadow pattern on the rangoli. On some rangolis a leaf or some flowers had fallen. Almost all rangolis stick to a range of designs that, I assume, are traditional designs. And then I spotted this little one that brought a smile to my face. It is so heartening to see, what I’m calling, ‘everyday art’ in the lives of these people. May the custom continue and thrive! We found travelling between cities in Italy uniformly easy. However our experience of intra-city travel ranged from being super-easy and super-convenient to being one that would take some planning and effort. Here’s how the system generally works. The metro / tram / bus tickets are sold at the ‘tabacchi’ – a shop where you get newspapers, magazines and sometimes other assorted small stuff. There are self-serve kiosks for tickets at the metro stations too. Very rarely (perhaps never) did we see such kiosks for buses or trams. When you take the metro, at the entry point into the station, you have to pass the ticket through the machine and collect it at the other end. When travelling on a bus or tram you have to validate the ticket by inserting it into the yellow machine inside the bus / tram. The date and time gets stamped on it. Usually the ticket is valid for 90 minutes. Our first intra-city travel was at Milan. We landed at Milan Malpensa airport and took the Malpensa Express to Milano Centrale station. We hadn’t purchased the tickets in advance. It was quite easy to purchase the tickets. The price was fixed – I knew of it earlier thanks to my intense Internet research. There was a counter where we bought the tickets, went to the station, hopped on to the train and reached Milano Centrale station. In Florence we were staying a little further away from the centre. And the connectivity and frequency wasn’t as good as Rome. So we had to plan a little around the bus schedules. In the centre we walked everywhere. So that wasn’t a problem at all. But when we had to return to our apartment after a day of walking around the centre we found it tricky since the buses were few and far between. We reached Venice in the late afternoon. There transport is Venice is all done by ferry. There are no cars, buses or trains. As we walked out of the Venezia San Lucia station, we found ourselves on the banks of the canal. It was amazing – a railway station on one side and a canal on another. It was quite crowded. The ticket booth was right in front of us. But we discovered that there are different ticket booths for different routes. The routes are mentioned on the booths. You have to know the route in advance though. The ticket booths were quite close to each other. So that wasn’t a problem. We bought tickets and hopped on the ferry. The next morning we purchased a 24-hour pass. It was very convenient after that. We just checked routes (on Google maps) and took ferries wherever we wanted. We even took the ferry, on the day pass, to Murano island. Here’s a view from the ferry on the way there. All cities in Italy that we visited had local travel passes for 1, 2, 3 days or even a week. However we didn’t buy them except at Venice. In Naples we also had the pleasure of travelling on the funicolare. It is a great experience. Especially while coming down the hill. One incident stands out in memory. We were leaving Naples for Rome on a Sunday. We had the ticket from Naples to Rome but we had to take the metro from our AirBnB accommodation to the Napoli Centrale / Piazza Garibaldi station and we didn’t have the ticket for it. We had planned to buy it on our way to our metro station from a tabacchi on our street or the one on the station. But apparently the country closes down on Sundays. Not a single tabacchi shop was open. There was nobody on the station except us and another couple. The tabacchi shop was closed. So we were perplexed as to where to buy the tickets. Then I spotted two kiosks. So we went towards them only to discover that they weren’t working! We had to reach the Garibaldi station soon since we had tickets to Rome and we didn’t want to miss that train. Just then I saw a man in a black uniform. He opened a closet near the kiosk and put back a bucket and mop that he was carrying. I went to him as through gestures and broken sentences told him of our predicament and asked him what we could do. He asked me where we wanted to go. When I said Garibaldi, he gestured that we should simple go without ticket. Even the turnstiles at the entry point weren’t working. They were open and we could just walk through. I thanked him but P and I hesitated. We stood around for a bit wondering if we should actually travel without ticket in a foreign country where we had seen prominent signs declaring that without-ticket travelers would have to pay a stiff fine. I think we could be fined up to Euro 250 for not buying a ticket worth Euro 1.50! But we had no option and decided to just do as told. We even planned how we would explain if caught. Thankfully everything worked out just alright and we boarded our train to Rome without incident. I loved the transport system in Rome the most. Also, in Rome the bus and tram stop was exactly opposite our apartment. In Rome the frequency and coverage of the public transport is extensive. So we had it easy. Yet, in Rome we had some interesting travel incidents. The very morning we reached, the Sunday, we were able to purchase a ticket outside the Roma Termini station since at least one tabacchi shop was open. This time we decided to preempt such situations in the future and bought a few more tickets than we needed. Then on the tram we tried to get the tickets validated but the machine wasn’t working. So here too we travelled without ticket! On another day we were travelling by a tram that was jam-packed. Suddenly at one stop about 4/5 tickets checkers entered and suddenly there was a flurry of activity. About 7/8 people rushed to validate their tickets, the ticket checkers caught hold of about 5 and they had to pay heavy fines. On another occasion, we were out all day. We must have walked at least about 10-12 kilometres that day. We were looking to go back to the apartment and crash. We checked the metro, tram and bus routes and schedules. There was a metro station 2 minutes away and the last metro for the night was leaving that station in 2 minutes! Had we missed that train we would have to walk 10 minutes to a bus station and take a longer route back. We were dead tired and our feet were aching but we ran like crazy to the station. En route, the strap of one of my sandals snapped but I kept running…we were that desperate! We managed to board the train exactly 2 seconds before it departed! How gladly we sank into the seats! All in all, the intra-city transport systems in Italy are more or less (in our experience) easy to figure out and navigate. Also, P and I usually love to travel on public transport in any new city and we had fun doing that in Italy. I am going to tell you about two types of local travel – inter-city and intra-city. But today I’ll only share our experiences of the inter-city train travel. While researching inter-city travel in Italy I found out that it was possible to book train tickets between two cities online even before we left India. So we did just that. 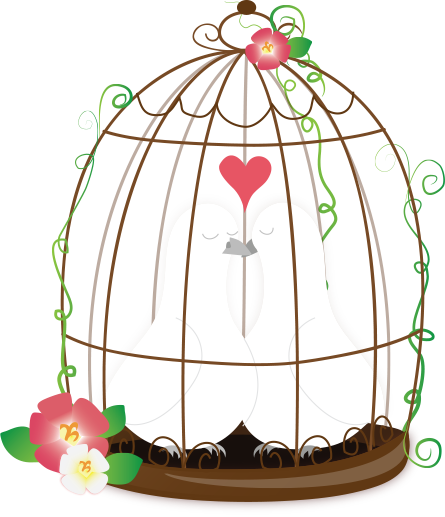 It was very convenient since we could choose the timings and rates that most suited us. We used Italiarail. I saw some online comparisons between trenitalia and italiarail. But try as I might, I couldn’t make a booking on trenitalia – the website constantly kept giving error messages. (Now I see that its working.) So we booked with italiarail and we have no complaints at all. This is the route we followed: Milan – Venice – Naples – Rome – Florence – Pisa – Vernazza – Milan. It is possible to book the tickets at the station too. There are kiosks and booking counters. The tickets rates are fixed for some journeys. So these bookings can be done in Italy itself. That can give you a little time-flexibility. For other journeys the ticket prices vary according to the time of travel I think. So you can choose beforehand. When we booked the tickets online, we were also able to choose our seats. Since we booked them even before we left India, we carried prints of the tickets with us. Whenever the ticket checker came along, we simply showed the print to him. When we bought the tickets at the station, we had to validate them at the station. There is a yellow machine on the station. You insert the ticket in it. It prints the date and time on it. Then you can use the ticket. If you have not validated the ticket, you might have to pay a stiff fine. In fact, on our train from Florence to Pisa, two Korean girls sitting opposite us hadn’t validated their tickets. Almost immediately after the train left Florence station, we got talking and somehow the subject of validating the tickets came up. That’s when they discovered that they hadn’t done it. I told them they might be fined if the checker came along. I suggested that one of them should step out of the train at the next station and quickly get the tickets validated. So we kept waiting for the next station. As the train was entering the station, I kept a lookout for the yellow machine and soon I spotted one. As soon as the train stopped, one of them popped out of the train and ran to the machine. In about two minutes the train started moving. Her friend and I grew frantic thinking she got left behind. But in about a minute she reappeared. She had caught the train in the carriage just opposite the yellow machine about five seconds before it began moving. We all heaved a sigh of relief. Inside the train you have an indicator in each carriage that shows the route on a map, the speed of the train, the stations of origin and destination as well as intermediate stations. Some trains also had food trays. All trains had waste bins. All trains also had large windows to enjoy the views, which, I must say, are fabulous no matter what route you travel on. Rome Termini, Florence S. M. N. and Pisa stations pale in comparison with Milan with regards to art. The Vernazza station, like others in Cinque Terre, is half inside a tunnel and when you exit it, you walk down a flight of stairs and find yourself on the main street of the village. On the journey from Venice to Naples, I had a minor incident. 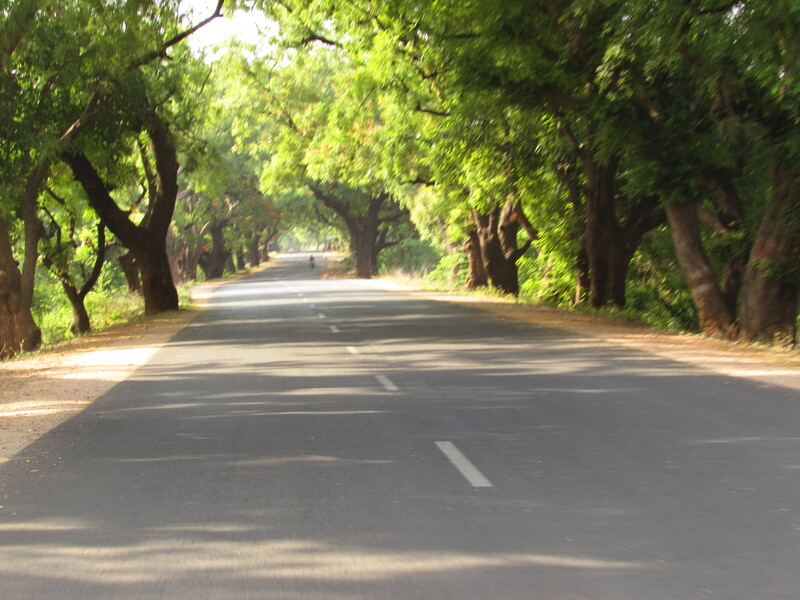 Some background first – I get severe motion sickness whenever I travel by road. My back, shoulder and neck muscles constrict and I get a headache of humongous proportions. Also I start feeling out of breath, sort of gradually choking. The only exception is when I am travelling on a two-wheeler. Somehow it never happens on flights or train journeys. So I never imagined that I’d get close to being sick on a train. So here’s what happened. The train that we took from Venice to Naples went through a largely even terrain till Bologna. Thereafter it went through a lot of tunnels and at very high speeds. Towards the end of the Bologna-Naples leg, the train kept banking left and right at very high speeds and in quick succession. Very quickly I started getting sick – my breath became shorter and I started sweating and slightly gasping. A very cute young Japanese couple sitting across the aisle noticed my rapidly increasing discomfort and got quite alarmed. They offered help. But till then P had given me water to drink, the train had stopped swerving left and right at random and I had begun to recover. I smiled reassuringly at them and thanked them. They relaxed. When our flight was landing at the Milan Airport, we saw the beautiful snow-clad Alps. There was one moment when both P and I turned to each other and said “Alps!!”. After landing, as we walked to the luggage carousel through the corridor lined by full-length glass, we saw the Alps again and were overjoyed. Then we went to the train counter and bought tickets for the Malpensa Express that would take us to Milan Central station. We thought we had left them behind. But, as the train left the airport, we saw them again and were happy at this unexpected view. It was a beautiful sight! The Naples-Pompeii return journey is on trains that are clearly closer to the bygone era than now – in terms of their look and feel, their sound, their speed, the hordes they carry and even the stations they pass by. Entering Venice by train is surreal. At one point you feel that the train is floating on water. You know you’re in a train but you feel as if you’re gliding on water in a boat. The best train journey was from Pisa to Vernazza. From Riomaggiore the train weaves its way in and out of tunnels cut into the cliffs of Liguria. In fact, the stations are half inside a tunnel. When the train exits a tunnel and before it enters the next, all you see are the rugged cliffs and the glistening vast blue sea till the horizon. Such peace and wonder fill your being! We felt that staying at an Airbnb accommodation seemed more personal than staying at a hotel. Sometimes the accommodation is shared with the house-owners. Out of the six places we stayed at, we shared three with the hosts. P and I were a bit skeptical about sharing the home with others…especially sharing the bathroom 🙂 But our experience in this was very smooth. It is a unique experience sharing the house with the hosts. We had great conversations with our hosts. We also got great recommendations for sight-seeing (places that tourists might not usually visit) and food (where locals eat and specific dishes). In one of our Airbnb places we made Indian breakfast and shared it with our hosts. In another, the host brought fresh homemade pistachio gelato from a short visit to a cousin living in a nearby village. We had the other three accommodations all to ourselves. All three hosts were prompt in receiving us at the appointed place, showed us their home with love and also shared recommendations. One host was constantly in touch when our train got delayed and even offered to pick us up at the station. Another offered to carry our luggage up some very steep stairs. I must say that we got really friendly hosts. Usually the areas where the Airbnb accommodations are located in residential areas where you can observe how the locals live and live a little like them too. It was interesting to watch locals go about their daily routines…children walking to schools, shop-keepers opening up their shops, people gathering in the piazzas to chat…it felt like we were a part of this life. We travelled by local transport everywhere and walked as much as possible since that it the best way to discover a city. Often the accommodations are less expensive than hotels. For people on a budget, this is a very good option. Of course, it is to be understood that you have to practice due diligence while choosing an accommodation. Once you have selected the right accommodation, you can rest easy. However, it must be said that sometimes untoward circumstances might pose problems for you or your host. In that case a little compassion and patience will go a long way. Also, the hosts are opening up their homes to guests. As guests it is important to respect that and treat their homes with care. We interacted with locals, had great conversations, got a glimpse into their lives. We were able to live like locals, soak in their culture, visit off-beat places and eat like locals. All this for a reasonable cost. So, for us, the Airbnb experience was truly wonderful. I would highly recommend using Airbnb on your travels. 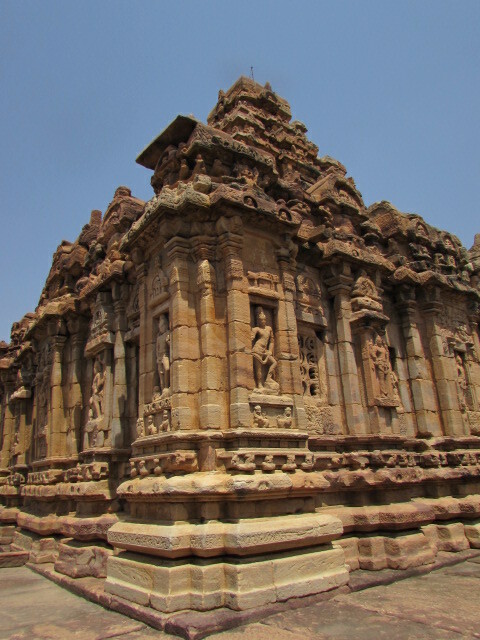 We did a motorcycle trip to Hampi-Badami from 25th May 2015 to 1st June 2015. In all it was 1342.5 kilometres in 8 days. I drove all the way. Here are some experiences from the trip. Everywhere we went, we were a topic of curiosity and discussion. I got stared at. A lot. A LOT. A woman driving a motorcycle isn’t a common sight in the interiors. Many saw me and then hurriedly pointed me out to their companions. Everybody did it – staring and pointing – kids, men, women…everybody. Unabashedly. All those with whom we interacted – hotel and restaurant staff, policemen – initiated conversations and wanted to know all about our journey from Pune to their town on our 18-year old 110 CC motorcycle. The unasked (so, naturally, unanswered) question was how come the woman was driving and not the man. 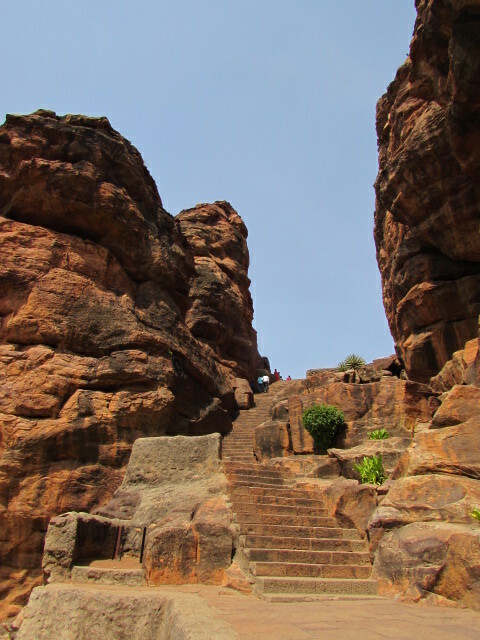 We were at the Badami caves. One girl walked up to me and asked me, “Yavuru ?” I replied, “No Kannada. English ? Hindi ?” She repeated her question but saw me shrugging and laughingly walked to her family to whom she said something in Kannada and they all laughed. A bit later one guy came up to me and asked, “Which country ?” I was a little surprised. Did he think I was a foreigner ? I don’t look like one. So, in a tone that displayed some surprise I said, “India !” He then asked, “State ?” I said, “Maharashtra”. He just gave a me long hard look and walked away. This happened a few more times during the trip. After a while I just found it funny. The funniest point came when we walked to the ticket booth outside Lotus Mahal in Hampi. There was a middle-aged lady selling the tickets. P offered Rs. 20 and pointed to both of us while saying “Two tickets”. The lady took the money, then stopped in her tracks and took another look at me and spoke to me in Hindi, “Kahan ?” (Where ?) I thought she’s trying to make small talk. 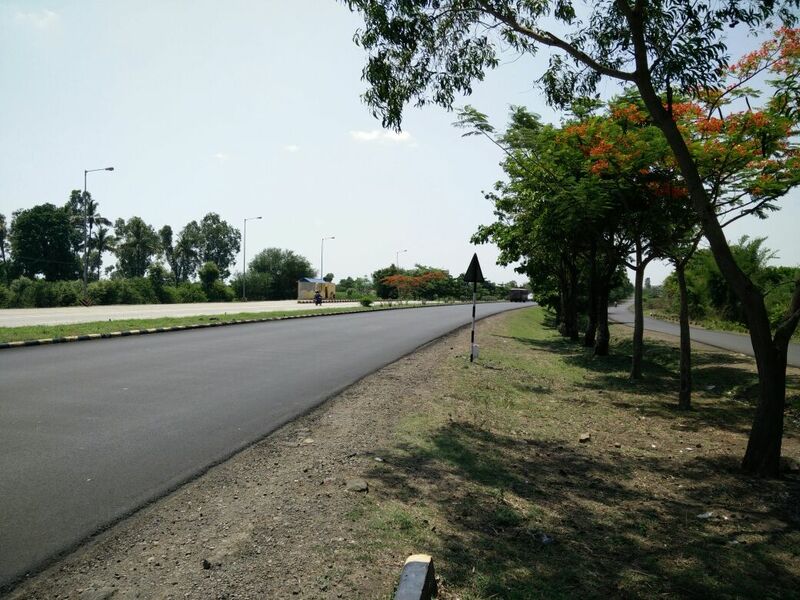 So smilingly I replied, “Maharashtra, Pune…near Bombay”. She didn’t smile back and asked, “Hindi bolti ?” (Do you speak Hindi ?) P realized why she was questioning me. He interrupted to answer, “Haan, thoda Kannada bhi bolti hai yeh.” (Yes, she also speaks a little Kannada) I added, “Haan, main Hindi bol sakti hoon. Nanage Kannada swalpa swalpa baruttade” (Yes, I can speak Hindi. I know very little Kannada). Suddenly the woman burst out laughing and said, “Mujhe foreigner lagi. Main 250 ka ticket deti !” Now it was our turn to burst out laughing ! Despite so many instances of people mistaking me for a foreigner, one of which happened right near my home in Pune a few years ago, I still don’t agree with anybody who thinks I look like a foreigner. Admittedly I am fair and when I wear a scarf I might look like a Parsi at the most…but a foreigner ? Nah ! Most petrol pumps that I saw in Karanataka, except the one at Belgaum, were manned by boys no more than twenty years of age. 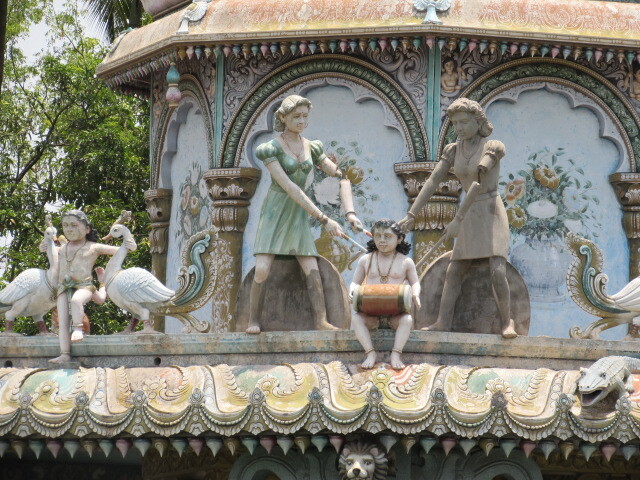 In Hospet, in fact, the two boys were not over fifteen. 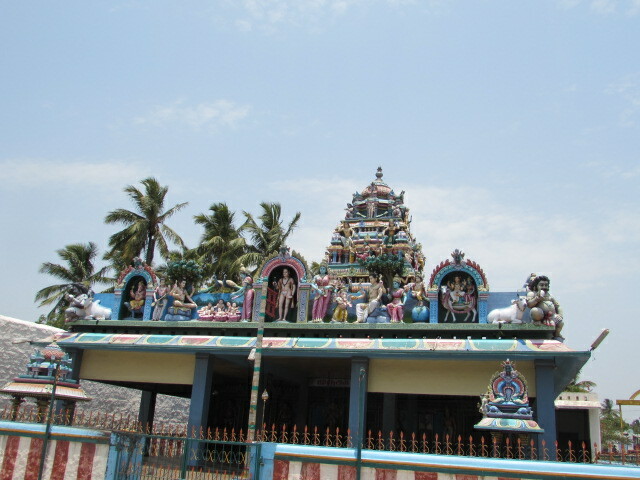 One day while returning to the hotel after visiting the Virupaksha temple, we saw this temple where we saw statues of two European frock-wearing ladies alongside ladies dressed in traditional dance attire. Here’s the photograph. 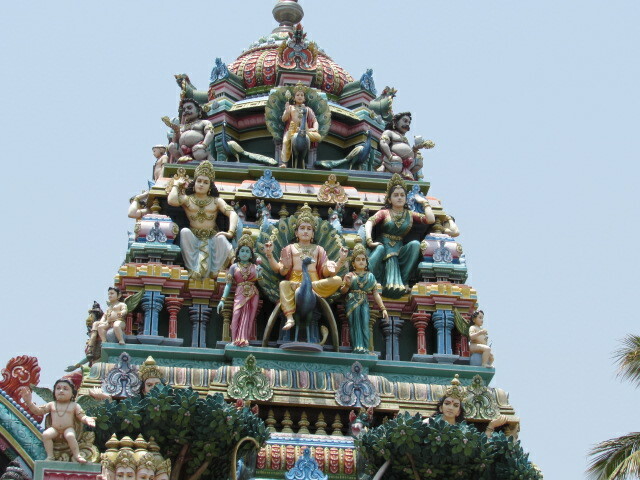 On the same route we saw this relatively modern Murugan temple with such beautifully crafted statues that we had to stop and take pictures. 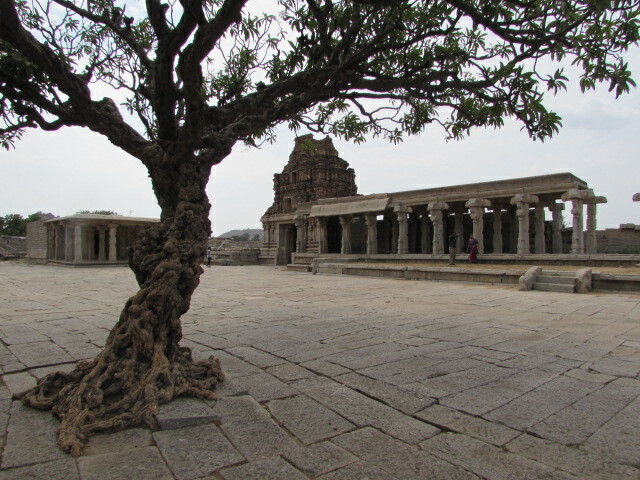 On the third morning we left Badami for Hampi. 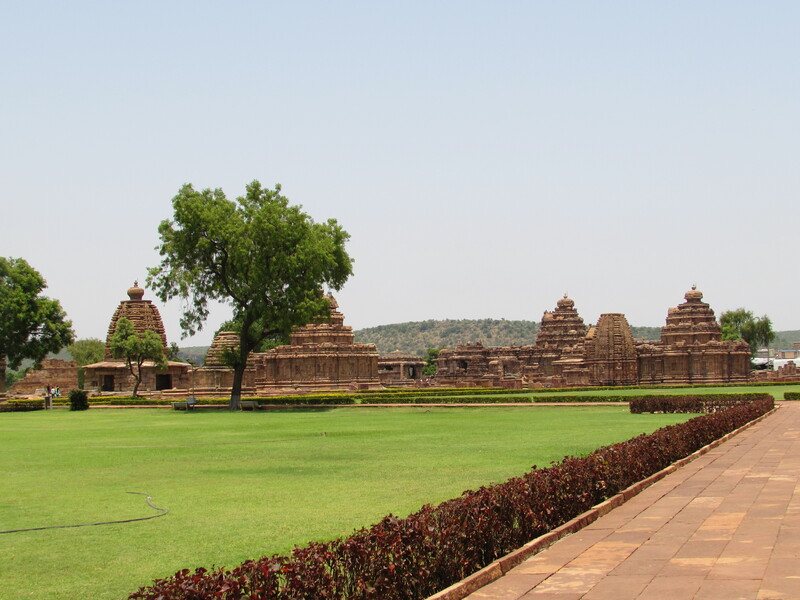 We stopped to see the ancient temples at Mahakoot, Pattadakal and finally Aihole along the way. 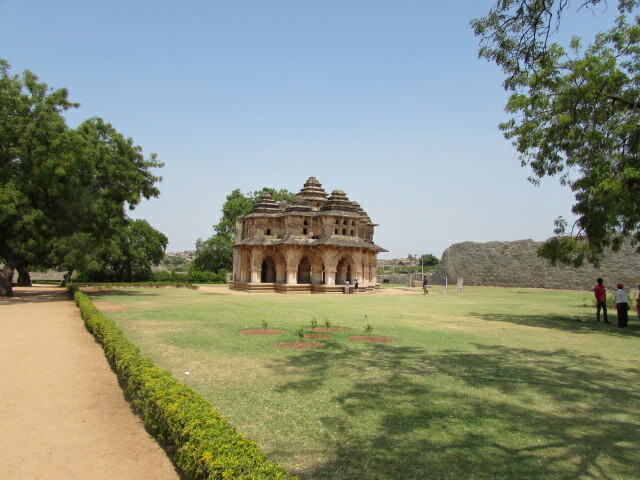 So we left Aihole at about 3:30 p.m. We had been in the sun all day and were sweaty. 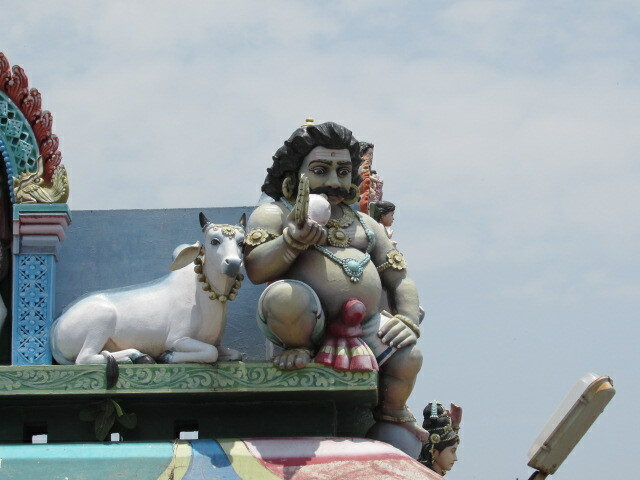 We thought we would be in Hampi by 6:30 p.m. and were looking forward to a nice bath. The road wasn’t very good till we reached National Highway 50. Then it was fabulous. A while later we saw the sky was very dark to our left. We were on the margins of a humongous black cloud. So we decided to speed up and escape getting caught in the rains, if at all they began. Thankfully the road was clear. We covered a good distance despite the increasingly strong winds. We thought we were going to be free. Just then a little ahead, when were 2 kilometres before Kushtagi, we saw the beginnings of a teeny tiny mini tornado. Luckily there was an exit from the highway close by. So we took it and stopped in front of a small tea-stall that had tin walls and a tin roof. We were just discussing if we should proceed or not when the wind became very strong and it stated drizzling. I was inclined to continue while P was in two minds. Suddenly the tea-stall owner came forward and started rushing us. P simply started walking behind him. I was slightly annoyed and asked why he was rushing us inside but nobody answered me. I had no choice but to lokk the motorcycle and follow P. The tea-stall owner practically forced us to come inside his tea-stall quickly…and with good reason too…the moment we stepped inside a violent storm began…lightning, thunder, a strong gale and heavy rains ! The tea-stall owner, his mother and brother and a couple of other people were already huddled there. They gave us chairs to sit on. The tea-stall owner explained that if the tin walls or roof flew off and we were standing on the road, nobody could predict what kind of mishaps might occur ! That is why he forced us. They had already switched off the electric current and they asked us to switch off our mobile phones too. Then all of us watched the storm…the tin roof and tin walls of the tea-stall were shaking…the gale was so strong that for a brief while I really believed that they would soon fly off. A bit later we started chatting. We discovered that some of their relatives stay in Pune. They asked us about our trip…especially the part about driving the bike and the route. When we said we planned to return via a particular route, the tea-stall owner’s mother said that it was a longer route and told us a shorter one and insisted we take that route. We drank tea with them and waited for the storm to subside. About 40 minutes later the whole drama stopped. Then we thanked those guys and resumed the journey. The weather was now magnificent and we were enjoying the ride when once again it started drizzling. Though, thankfully, this time it was just rain and mild winds. We didn’t stop. We just continued as fast as we could. We saw the most amazing lightning show I’ve ever seen. It was marvelous ! What fantastic evening ! In the Virupaksha temple at Hampi, we again encountered a bunch of kids who wanted to be photographed. The only difference was that these kids wanted to be photographed with us. A sweet little girl called Shivleela approached me and asked for a photo. When I said yes, all her brothers and sisters, or cousins perhaps, came running and when I started taking a photograph, she pointed to P. They wanted a photo with him…Then one with me…And then one with both of us. Each time she made sure she stood next to me. I put my arm around her shoulders very lightly but she pulled me closer. We didn’t know each other’s language but somehow we communicated where we were from, our names, the name of her school and the class she studies in. Such interactions always intrigue me. I shall remember them whenever I think about this vacation and I can look at the photographs too. But what are they taking away from it ? They don’t even have the photograph as a memoir of a fun thing they did while on vacation. 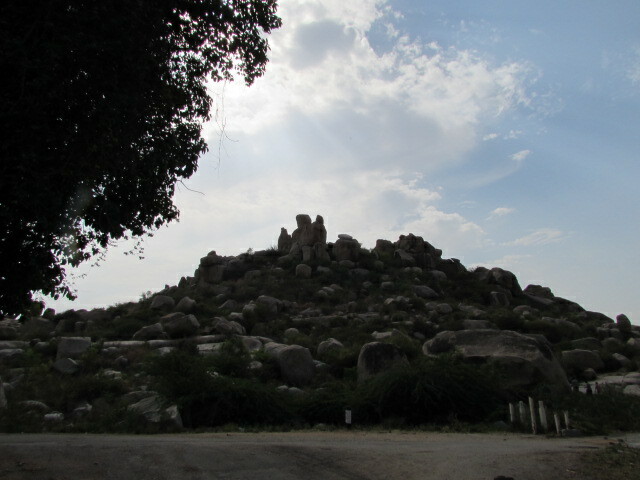 Twice in Hampi we were flagged down by policemen. Now, to me, policemen flagging you down is not a welcome event even if all your papers are in order. You have no idea what they will come up with to extract ‘a pound of flesh’. But with a very cool demeanour and a wary, and weary, feeling in mind, I stopped the motorcycle and we went to them. They wanted to see my driving licence and the vehicle papers. After I showed the papers to them, which were perfectly in order by the way, I waited for them to make their demand. To my immense surprise, and relief, they waved and asked me to leave. In fact, the second time, one of them came to the motorcycle and asked us about the trip, praised the ‘very old but very sturdy’ bike I was driving and wished us luck before seeing us off ! The experience to beat all experiences is when I was driving on the magnificent tree lined roads of Karnataka with nobody in sight ahead or behind and only the sound of the wind in my ears. P.U.R.E. B.L.I.S.S. ! You may think I’m a little ‘this’ or too ‘that’. Perhaps I am or maybe I am not. It is what it is. I am what I am. You can call me names, give me labels and put me in a slot. I won’t take it. Even if I’m what you think. Especially if I’m not. Its only your opinion, an image you have formed. You are free to judge. It may be true, it may be right. But I don’t think I’ll budge. On my path I will walk as I please. It is my sky. It is my flight. I’m not ashamed of myself. Nor am I proud. I’m just alright. In this moment I am writing about what I am thinking of at this moment. In this moment I am thinking about the translation that I am supposed to do instead of writing. In this moment I am worrying about whether I will pass the voice audition tomorrow. In this moment I am thinking about what to cook tomorrow. In this moment I am recollecting how calmly I dealt with the person who tried to spark an argument yesterday. In this moment I am wishing for good things to happen to a friend going through a bad time right now. In this moment I am wondering why there are so many unrelated thoughts whizzing through my mind in this moment. Is it only a moment ? Or is it a collage of slices of different moments ?